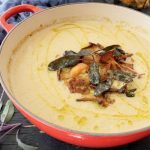 The ultimate, easy chanterelle mushrooms recipe that needs to be at your holiday table, tossed together with warm potato wedges, caramelized onions and lots of crispy sage. You can even treat yourself to a drizzle of that brown butter sage sauce at end, insanity! You know it’s all about those sides during the holidays, and if you are a wanna be vegetarian like me then it’s all about those sides all year long! Also mushrooms become your bestest friend you ever had, because they are the closest substitute for meat. I’m especially fond of golden chanterelle mushrooms, can you blame me ? 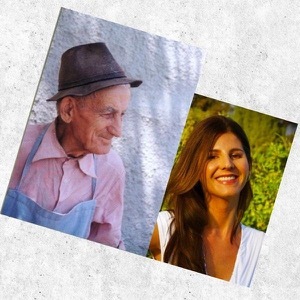 I can’t wait to see them show up at the market in the cooler months, like a kid on Christmas Eve I swear! I feel that chanterelles are so different than any other mushroom out there, they have a really distinctive flavor and fun look. 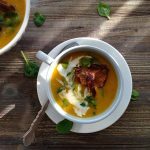 So I constantly dream of new chanterelle mushrooms recipes I’ll make with them. Today, I present to you my newest fall obsession: this warm potato salad with golden chanterelles, caramelized onions and crispy sage. 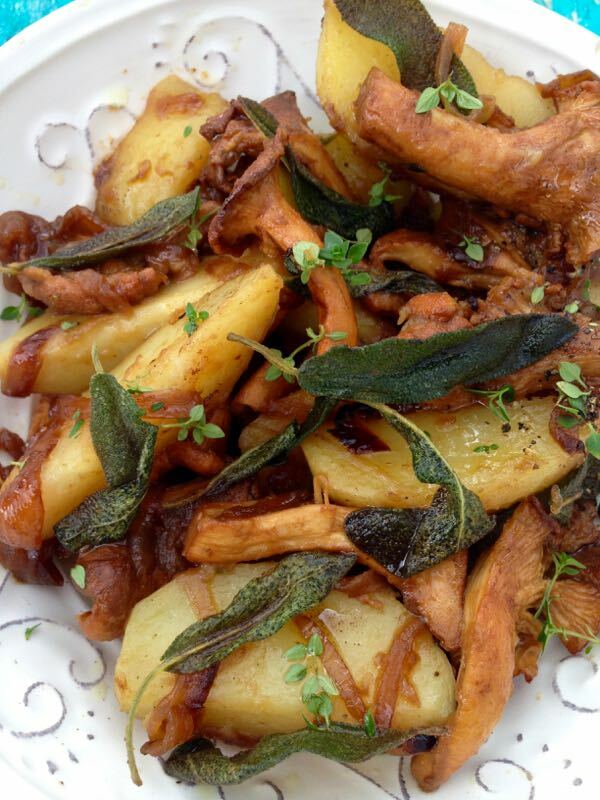 I couldn’t get my mind off of sage and potatoes since I made that truffle chicken with roasted sage potatoes recently. So I had to give them a spin in a dish of their own. I slowly caramelized onions with a drizzle of Sicilian honey, oh yeah, to which I added some meaty chanterelles to sauté together and pick up on all those amazing flavors. Then I cooked some golden potato wedges to toss together with that goodness. Not like things weren’t already amazing, but I also crisped up some sage leaves in salted butter you guys, just to sprinkle all over the top. Say whaat ? I wish you could smell the shack at this point. Ridiculous! I have a new serious obsession with crispy sage. 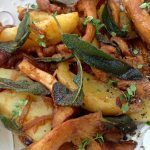 If you want to make the vegan version of crispy sage potatoes, just crisp up your sage leaves in some olive oil or coconut oil instead of butter. Simple as that! I’ve gotta tell you tough: crispy sage leaves in salted butter are everything. Your call! I know I could eat those as an appetizer by themselves, just like that: one crispy sage leaf after another, slowly savoring every single bite. 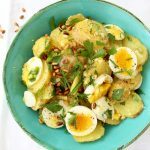 Goes well with salmon, grilled chicken, a squeeze of lemon or a few of these soft boiled eggs on top. 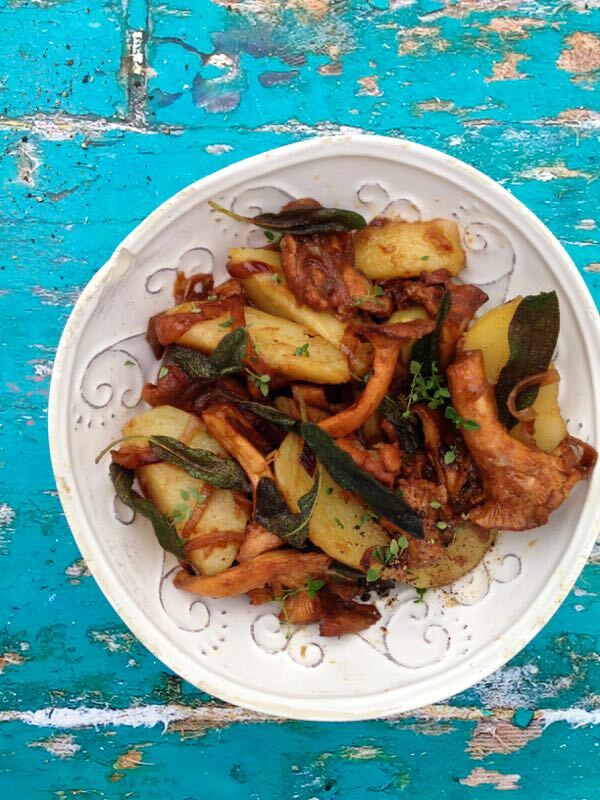 The ultimate chanterelle mushrooms tossed together with warm potato wedges, caramelized onions and lots of buttery crispy sage. In a large sauté pan over medium low flame add a lug of olive oil. Add the sliced onions with a pinch of sea salt and sauté until Caramelized, about 45 minutes. About half way through cooking add the honey and a little bit of water to deglaze the pan and keep the onions from burning. Stir often. Add the chanterelle mushrooms to the pan with the onions. Season with a pinch of sea salt and sauté together for a few minutes until the chanterelles have wilted. Adjust seasonings to your taste with more sea salt and keep warm. Cut the potatoes into wedges and add them to a big pot together with the rhyme and bay leaf. Cover with cold water and bring to a simmer. Add 2 tbsp of sea salt. Cook potatoes for about 15 minutes until al dente. Drain in a colander and allow them to dry in their own steam for a few minutes. Add the potato wedges to the pan with the Caramelized onions and chanterelles and gently give them a toss to coat. Add more olive oil if desired. In a separate skillet melt the salted butter on medium flame and add the sage leaves. Cook together until the sage leaves are crispy and the butter is browned taking good care not to burn it. Using tongues transfer the crispy sage leaves to a paper towel lined plate do drain. 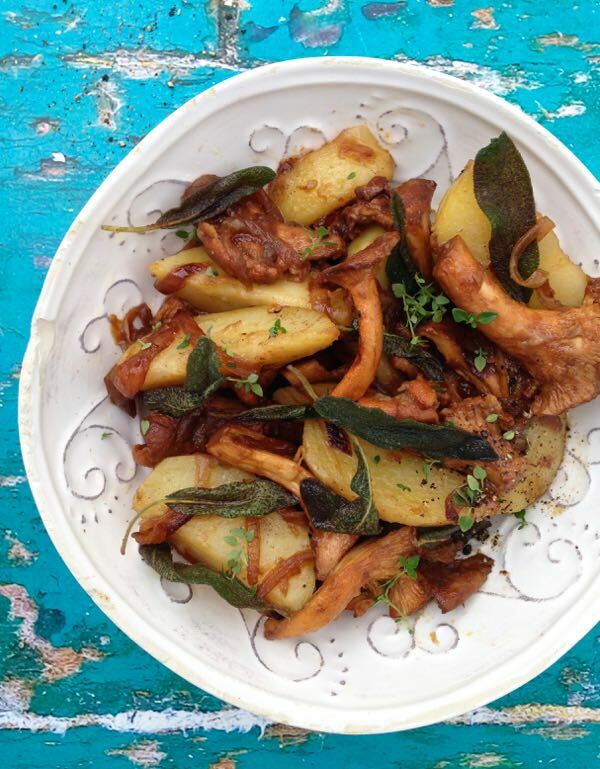 Transfer the potatoes and chanterelles to a serving bowl and sprinkle with the crispy sage. Just before serving drizzle the brown butter over the top as well. Florentina, can you come and cook for me, I would eat everything you make, honestly you have the most amazing homemade comfort food. 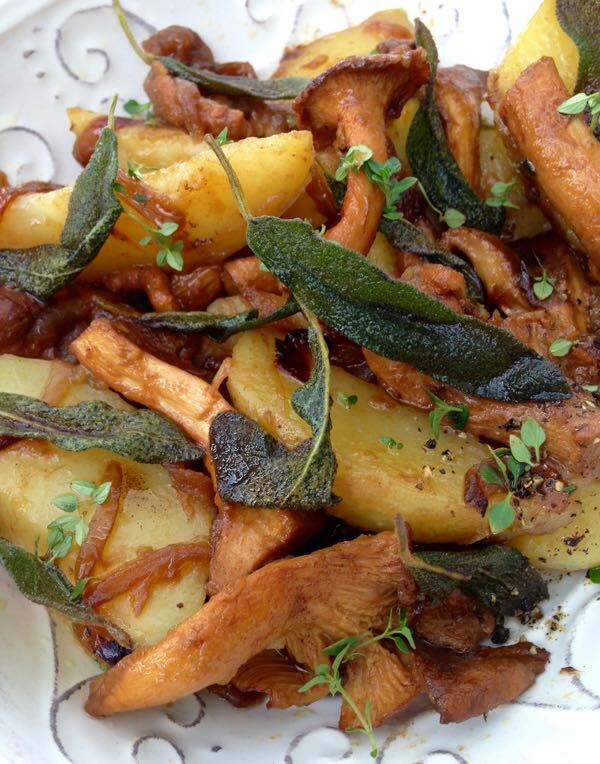 I love mushroom and potatoes, one of my favorite combos and with that fried sage, its amazing! Shared! Oh wow does this sound good for the Thanksgiving table! I LOVE crispy potatoes and then you add sage! I am obsessed with sage all fall long. Oh my yum! That looks absolutely amazing! I’m definitely going to try this. Mushrooms and potatoes. One of my most favorite dishes ever. We forage mushrooms every single year and that’s exactly what we do with them. Your recipe looks much better than mine. Bookmarking! awww thanks Igor, I’m dying to go look for mushrooms up North. Such a great experience! Love sage or any of the deep herbs with potatoes! And that crispiness! This recipe looks so tasty. 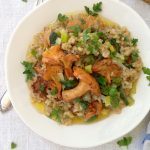 Love the addition of chanterelle mushrooms as they have an amazing flavour. Yes yes yes yes! This is my idea of perfect side!